Entries and Late entries are now closed for 2017. 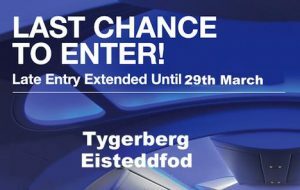 Eisteddfod Administration would like to thank all those users who registered and logged Entry and Affiliation Forms this year. Although few users experienced problems, overall the digital online Entry forms worked successfully and on reconciliation total entries are at an all time high.